When buildings burn, we expect the fire brigade. It's a public service funded by the tax payer. But a political row has been ignited by government plans to allow fire fighting and rescue to be outsourced and bring in private contractors. That alarms Labour MP Chris Leslie, a former fire minister in the Blair government. He's furious that the government's fire services minister Brandon Lewis used the parliamentary Regulatory Reform Committee to get the changes, rather than introduce a new bill. "The ministers are taking this through a committee - a little known committee in the House of Commons - but actually I think they should have the courage to admit what they are doing, which is out sourcing the entirety of the fire services," he told me. "I think it's a step too far. It's a different thing saying IT services or human resource management service within a fire fighting service should be outsourced, but to sell off everything is full scale privatisation. "I don't think that profit should be at the forefront in fire and rescue protection." The law allows only trained fire fighters employed by a fire authority to fight fires or handle other emergencies. That's what the government wants to change. In the North East, Cleveland is the first authority to consider transferring its fire fighting service to an independent employee-led mutual. In the East Midlands, union leaders say it's just not on. "Look what has happened in Lincolnshire," he added. "AssetCo actually own the fire engines. It's a private company. That means the councillors, who are responsible for the fire service, just won't have any say in it in future." But there are some privately run fire fighters - for example, at East Midlands Airport. It employs its own specialist crews. Is this an option the government wants? In a statement, the Department for Communities and Local Government said: "Fire and rescue authorities will remain statutorily responsible for this public service and to suggest otherwise is completely wrong. "The government does, however, support co-operatives and employee ownership. We are keen to work with local authorities and their staff wanting to explore the scope for employee-led mutuals, where there is local support and backing." That doesn't persuade Chris Leslie. "If the public knew that the fire service was on the brink of privatisation, they would be absolutely appalled," he said. "The police or the ambulance service could be next in line. Our emergency services should not be privatised." 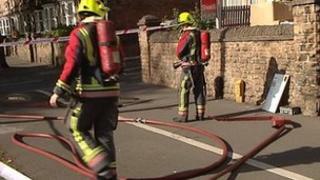 The government says it wants more cost effective alternatives for fire service delivery. The last Labour government attempted to release efficiency savings by creating a network of regional fire control rooms. Smart new buildings appeared. But, like the planned East Midlands HQ, it was never used and was mothballed at great public expense. The fire minister Brandon Lewis has a new approach. But even he recognises his proposals are "not without some level of controversy". Chris Leslie said: "They should have the courage of their convictions and bring forward a full bill. Because sneaking through is just out of order." The minister may have a political fire fight to win his argument to secure the changes he wants.